Photo Writing - Exploring Photography. 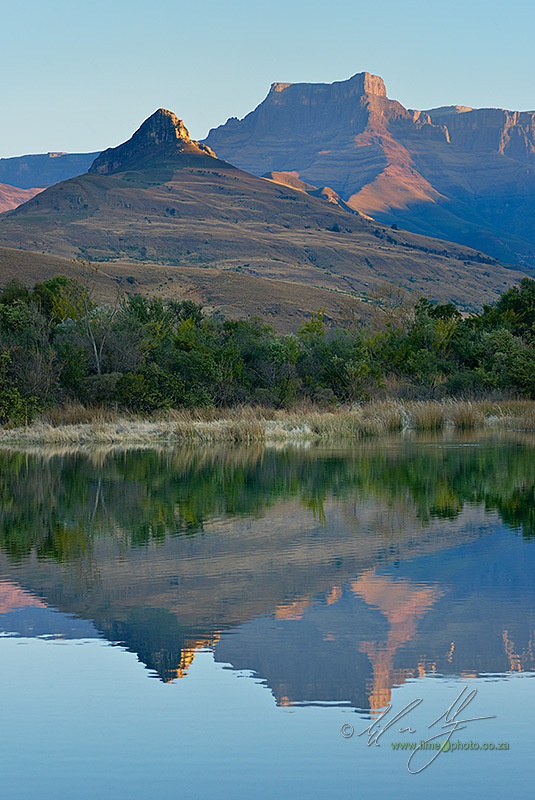 : Drakensberg Workshop and a note on Whether or not to go pro. I have just returned from another I fantastic workshop in the Drakensberg with a very enthusiastic group of 8 photographers. The weather smiled on us and the moon rose late, giving ample opportunity to do some star trail photography (genius workshop leader here even managed to do one with a lens cap still on. doh) Short tip though; make sure that the position you chose isn't anywhere near a party where curious drinking revelers keep shining lights out at your little group to figure out what on earth you are up to. That and curious, high-powered torch wielding security guards can be the death of any long exposure. Light polluting others besides, the weekend produced some lovely images from some very talented photographers (sadly I was only able to see images on the back of camera lcds in the end, but the images were there nonetheless and I look forward to seeing the finished results from the photographers soon). An interesting discussion arose with one of the photographers on the trip, Kellie Netherwood, who is a travel blogger and photographer of note (more of her work can be viewed on http://www.mydestinationunknown.com). The allure of photography as a profession can be incredibly strong at times, especially if one already has a penchant towards shooting and shows some skill. When a normal job seems onerous, and the idea of being one's own boss attractive, a great many hobbyist photographers opt out of their 9-5 securities and plunge into photography as a full-time profession. This isn't a comment about whether or not becoming a pro is a good idea. This is about what you are losing by doing so. Kellie is essentially a professional career-break artist. Whenever it is physically and financially possible, she takes a break and goes traveling. Photography forms a very strong part of her travel experience and is also an important part of her blog. So it's natural that the thought has crossed her mind from time to time as to whether to do this professionally or not. Her answer, at least for the time being is no. There are very good reasons for this too. First and foremost is the hobby aspect. 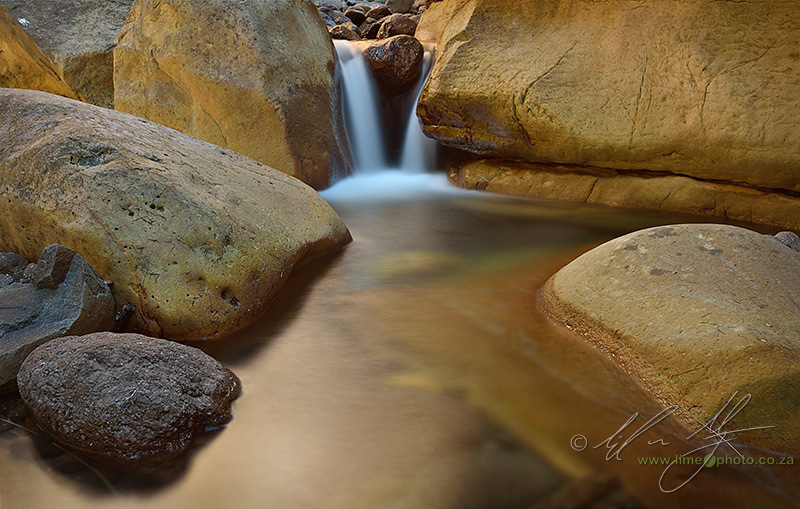 What a lot of starting out photographers don't realise is that they are basically losing their hobby. That 'thing' that they found release from their usual jobs with, is now the source of stress and anxiety that would ordinarily have gone with their previous 9-5 work. For a lot of photographers-turned-professional this can suddenly kill any passion that they had for the medium. Worse, it can turn the thing that you loved into a stressful burden, transforming it into the the same work that you might have hated before starting out. Secondly there is the financial loss that you are, at least initially, going to experience. Here's a basic equation to get your head round. Take your current salary before going pro and quarter it. If you are extremely lucky this is what you might earn after your first year of full-time freelance photography. The norm is even lower. If you happen to earn really well (let's say you are a private medical doctor, are in finance, IT, high-end consulting or another white collar job) you are probably never going to get paid as much again if you turn to photography. I say probably as there are an insignificantly small number of photographers who do pull in salaries that match upper-tier management salaries. These are the rock-stars of photography, and they are extremely rare. 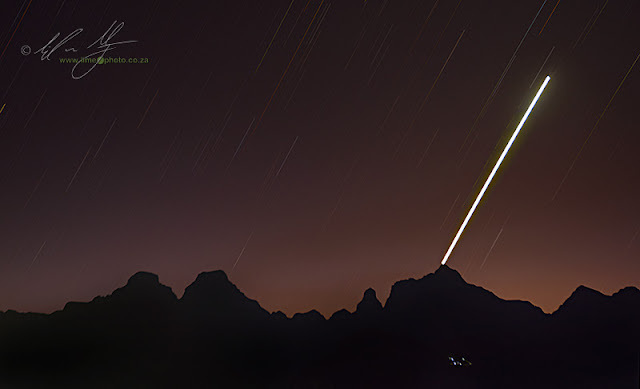 A star trail above the Cathedral Peak Range. The lights in the lower right are of hikers near Sherman's Cave probably heading up towards Orange Peel Gap. For Kellie, her overriding passion is travel coupled with photography. Giving up her day job would mean probably giving up the travel aspect of the current duo. Of course this doesn't have to be the case and the are a number of photographers out there who make a living doing just that: travel photography. Again, the reality is that these are a very small number, and probably took a long time and an enormous amount of effort to be able to do that. I still find the comment that Joe Cornish made to me about David Ward brilliant in this case: "it took him 20 years to become an overnight sensation". The basic gist of all this is that before you quit your day job you need to take a long hard appraisal as to why you are quitting. Sometimes it makes more sense to stick with the job and keep the hobby, rather than lose the hobby and the enjoyment of creating images. This shot was a bit of an experiment. 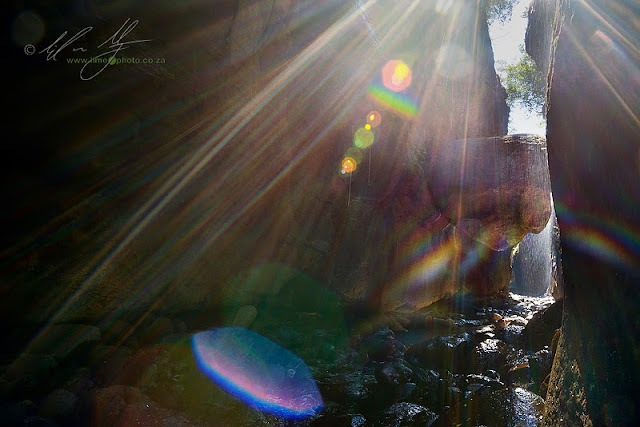 Handheld looking straight into the light in order to emphasize the shafts of light and flare while in Rainbow Gorge. Now, having said this, I love my job! I continuously need to pinch myself in order to make sure that what I am doing is real. I have that kind of all-consuming personality that is able to swallow up a hobby into a career. But, I have lost photography as a hobby and sometimes find it quite hard just to shoot for pleasure (our family album and its vacant pages are testament to this). I don't notice it as a sacrifice since I enjoy what I do so much. If losing the hobby sounds like too much of a risk, then it is. There are a great many photographers out there that shoot, simply because its a job. Be careful that this doesn't happen to you. As to the weekend itself. I had an absolutely fantastic time with a wonderful group of photographers. It's groups like these that really make me feel fortunate to do what I do for a living! Love this post Emil and you have articulated our conversation perfectly!! Thanks again for a fantastic weekend and I look forward to reading more of your posts here.